Coconut fruit belong to the palm family Arecaceae. It is an exotic fruit that is composed of several useful layers, has a distinctive odor and taste that makes it unique and favorite fruit of many people. It is used in all kinds of sweets, drinks and cosmetics. Coconuts were used by people long time ago; they made various specialties from it, cocktails, various sweets and other foods. The freshly harvested coconut contains sweet water which is extremely beneficial for health. Coconut is a healthy nut that can be used safely as a food. It is mainly reaction free. The kernel is not only healthy but is also safe to be eaten during pregnancy. It is also a very good source of B-complex vitamins such as folates, riboflavin, niacin, thiamin, and pyridoxine. These vitamins are essential in the sense that body requires them from external sources to replenish. The kernel is an excellent source of minerals such as copper, calcium, iron, manganese, magnesium, and zinc. For many people favorite part is the coconut milk. The pulp is very delicious has a distinctive smell and is very healthy. Raw coconut pulp has 354 kcal and contains 47 grams water, 33.5 grams fat, 3.5 grams protein, 6.2 grams sugars. Coconut pulp and water contain a very good amount of potassium. 100 g of fresh pulp contains 356 mg% or 7.5% of daily required levels of potassium. Coconut milk has a wonderful smell, tastes exotic and has fascinating milky appearance. 100 grams of the milk has 230 kcal and contain 67.7 grams of water, 2.3 grams protein, 24 grams of fat. Additionally, coconut milk contains significant amounts of magnesium, selenium, calcium, potassium and other minerals. Although coconut contains saturated fatty acids, the pulp and the milk are considered to be one of the healthiest fruits in the world. 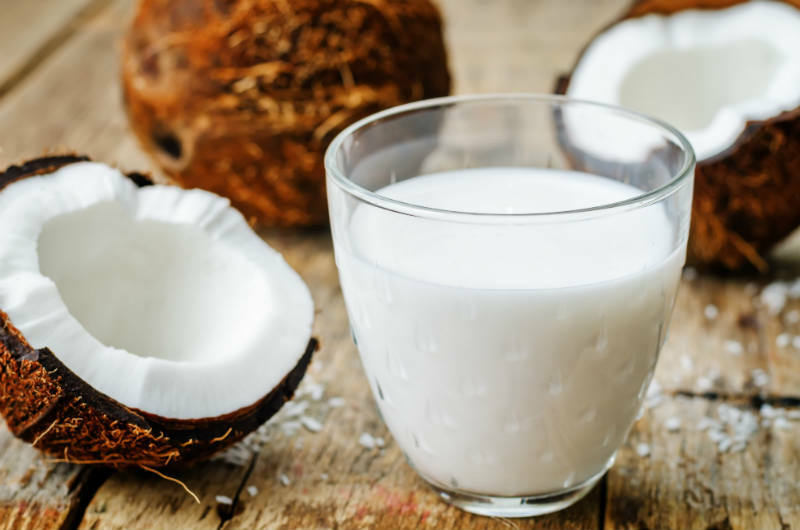 Coconut milk is called elixir of life and all studies have confirmed that people who regularly consumed milk lived very long. Besides that coconut milk is a real balm for the skin. It is a symbol of beauty and tenderness. Supports Healthy Bones and Teeth – Eating coconuts also supports the development of strong, healthy bones and teeth. It does this by improving the body’s ability to absorb calcium and magnesium. It also prevents osteoporosis, a condition in which the bones become thin and fragile and lose their density. This makes coconuts a good, healthy alternative for those who are lactose intolerant, but still want to have strong bones and teeth. Those who prefer a vegan diet can benefit from it as a good source of protein and fatty acids. Treats Pneumonia – A study conducted by physicians found that children with pneumonia who were given coconut oil as well as antibiotic treatment recovered more quickly than those who received antibiotics alone. The oil seemed to help clear up breathing, reduce fevers, and improve blood oxygenation. Reduces Epilepsy Seizures – A ketogenic diet is a low carb diet which is used to treat various disorders. Its best known application is treating epilepsy in children. The diet involves eating little carbs and large amounts of fat which can lead to increased concentrations of ketone bodies in the blood. Diet based on coconuts can dramatically reduce the rate of seizures in epileptic children. Immunity Booster – Coconut nutrition is excellent for the immunity system. It is antiviral, antifungal, anti-bacterial, and anti-parasitic. Intake of coconut oil can help the body to mount resistance to both viruses and bacteria that cause illness.Consuming coconut in its raw form can help to treat some of the worst and most resilient illness like throat infections, bronchitis, urinary tract infection, tapeworms and other ailments caused by microbes. Controls the Blood Cholesterol – Coconut helps to improve blood cholesterol levels in the body and lowers the risk of heart diseases. The saturated fats in coconut raise the good cholesterol in the body and control the LDL to a benign subtype. This improvement in cardiovascular risk factors theoretically leads to reducing risk of developing heart diseases. Prevents Skin Cancer – Improves the moisture and lipid content in the skin and prevents skin cancer by blocking 20% of harsh Ultra Violet rays. It can be used as a body and skin moisturiser as it hydrates the skin by replenishing the natural oils. Coconut oil can also be used to clean the face by rubbing it in circular motions. Coconut is exotic fruit which is a real elixir of health and beauty.